Summary: Harrison Ford as Indiana Jones minifigure, Sean Connery as Professor Jones minifigure, and quasi-Nazi minifigure; motorcycles and various "movie props"; Indiana Jones and the Last Crusade! Parts from: Denmark, Hungary, Mexico, Sweden, and the Czech Republic. Summary: Small set; small parts; brilliantly captures the heroic mundane; reminiscent of The George Lopez Show. Parts from: Denmark and China. Summary: Experience the network game show for yourself with host Jeff Foxworthy and a class of fifth graders; contains 20 different games (with video clips) and the option for individual/team vs. individual/team action! Obviously: Requires a DVD player connected to a television to play. Summary: Fantasy set full of stock characters: Knight in shining armor, noble steed, damsel in distress, fire-breathing dragon, evil wizard, and two skeleton minions - set in and around a skeleton-shaped tower. Parts from: Denmark, Hungary, and the Czech Republic. Summary: One knight, armed to the teeth. Price: About $3.50, or $1.75 for the minifigure and $1.75 for the armory. Parts from: Denmark, Hungary, Mexico, China, and the Czech Republic. Summary: Anachronistic fantasy set with three good knights defending a seaside fortress against an haunted pirate ship manned by three skeleton soldiers and the Skeleton Captain (a skeleton minifigure with a beard and pirate hat); think The Lord of the Rings meets Pirates of the Caribbean. Summary: Two good knights try to break a blockade (manned by two skeleton knights) using a catapult. Price: About $10, or $2 per minifigure (4 x 2 = $8) and $1 per building model (2 x 1 = $2)...or however you want to divide this set. Summary: One good knight, one good soldier, one horse, three skeleton horses, three skeleton warriors, and one creepy prison carriage (as if the undead horses and warriors weren't creepy enough). Price: About $20, or $2 per minifigure (5 x 2 = $10), $2 per horse (4 x 2 = $8), and $2 for a medium-small-sized construction set (the carriage). Summary: Obi-Wan Kenobi, his Starfighter, and a detachable Hyperdrive Booster Ring; more importantly, Kit Fisto! 575 pieces altogether. Parts from: Denmark, Hungary, China, Sweden, and the Czech Republic. Summary: One good knight on his noble steed versus one undead knight on a black skeleton horse; also comes with parts to build a jousting rail and a holder for various weaponry. Price: About $8, or $2 per minifigure and $2 per horse, with accessories as bonuses. Summary: Delightful puzzle-adventure games combining the iconic Star Wars saga (both trilogies) and the equally iconic LEGO® brand; action is cutely comical and not break-neck difficult; Wii remote can be used as a lightsaber for Jedi characters; both trilogies released previously as separate games; this re-release contains some new and/or modified content; great deal for first-time LEGO® Star Wars players; tougher choice for those who own previous versions. Obviously: Requires a Wii console. 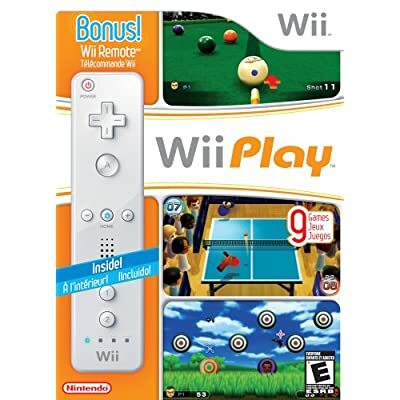 Not so obvious: For one or two players; Wii remotes (about $40 each) must have associated Wii nunchuk add-on (about $20 each). Also available for: Nintendo DS , Xbox 360 , and Playstation 3 . Summary: Five knights in shining armor vs. five undead knights in a cat's game; tic-tac-toe only fun for those who haven't figured out the limitation of this game; great minifigure army builder to augment other LEGO® Castle sets. Price: About $15, or $1.50 per minifigure with a snazzy little storage case and tic-tac-toe board as bonuses. Summary: To be released November 19, 2007; a glorified cradle for the Wii controller and Wii nunchuk, reminiscent of the original NES Zapper; expect Link's Crossbow Training to be a $10 training game for the controls, in the same vein as Wii Sports and Wii Play. Obviously: Requires a Wii console for gameplay. Summary: Several short games designed to hone your skill with the Wii remote; for one or two players; you essentially pay for a $40 remote and a $10 game; worth every dollar. Summary: Fun, exercise-equivalent play for the ENTIRE FAMILY right out of the box; includes five Wii Sports games; backward-compatible with Nintendo GameCube games; Wii console shipments picking up in November; buy one ASAP to avoid the holiday rush! Price: $250+ (depending on seller and Wii console bundle). Obviously: Requires a television set with A/V inputs.